Having received an education from what are considered to be the two most elite and prestigious academic establishments in France, the École Polytechnique high school and the Ecole Nationale d’Administration university – the latter having produced more than 5,600 of the country’s senior government officials, and several presidents, since its inception in 1948 – there is a strong argument that Frédéric Oudéa was destined for a position of power from the outset. The only surprises are probably that he achieved his success at such a young age and he did so in a privately-held institution. As with the majority of graduates of the École Nationale d’Administration, Oudéa began his career within the civil service. He worked his way industriously through the ranks, gaining experience within a number of government offices, including the Audit Department of the Ministry of Finance, the Ministry of Economy and Finance, the Budget Ministry and the Cabinet of the Ministry of Treasury and Communication. The most noteworthy highlight of his career with the civil service came in 1993 when he held the position of Technical Adviser in the office of future Prime Minister Nicolas Sarkozy, who was then the Minister of Budget and Communications. Following successful terms of office in senior treasury positions, in 1995 – at the age of 32 – Oudéa was recruited by Société Générale CEO Daniel Bouton, himself an alumni of Ecole Nationale d’Administration and also a former senior civil servant. Oudéa’s first role at Société Générale was that of deputy head (and then head) of the bank’s corporate banking arm in London. In 1998 he was placed in charge of the group’s global supervisory arm and was charged with the development of the equities division. In May 2002 he was appointed deputy CFO, becoming full CFO one year later. Oudéa’s accession to the top rank at Société Générale can be accredited to events that at the same time brought the bank to its knees. In January 2008 the bank announced that a futures trader – later revealed to be the relatively junior Jerome Kerviel – had lost the bank €4.9bn. Kerviel, responsible for the biggest loss in the history of futures trading, had, since 2007, executed a series of fictitious transactions totalling as much as €50bn – at least €20bn more than the bank’s actual market capitalisation at the time. The scandal left the bank and its management in disgrace. Société Générale’s headquarters, the twin towers known as La Défense, were raided by the police, Fitch downgraded the bank’s credit rating from AA to AA- and the bank announced that it would need to borrow heavily in the short term in order to plug the gap. Bouton’s position as CEO became untenable and he resigned from his post weeks later. In April 2008 Oudéa was revealed as the bank’s new CEO. The news came as a surprise to many, as he was less experienced and less high profile than many of his colleagues. Whereas Oudéa was undoubtedly an excellent CFO, the appointment was considered by some as political as much as strategic. 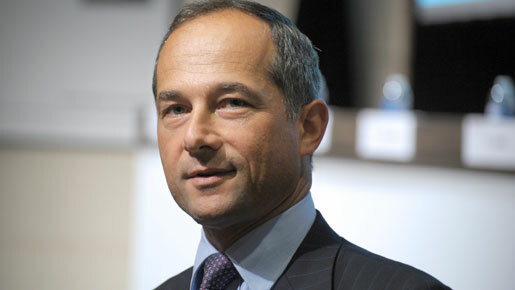 Jean-Pierre Mustier, head of the investment banking division, was regarded as the natural successor, but as he was closely allied to Bouton, his name too had been tarnished by the Kerviel scandal. At just 44 years old, Oudéa was not a member of the old guard, and his reputation remained relatively intact in the wake of the affair. Since taking the reins, Oudéa’s principal objective has been to restore investor confidence and demonstrate to the market that Société Générale is a steady ship once more. Amid the Kerviel scandal, it had been suggested that the bank had been aware of or complicit with the actions of the rogue trader. Drastic action needed to be taken, and Oudéa implemented a wholesale restructuring of the trading division, removing several key people and installing new teams. He also implemented a new set of checks and balances to ensure that the omissions and oversights that allowed to the fraudulent trades could not be repeated. Aside from the scandal, at the time of Oudéa’s appointment, Société Générale was also struggling to cope with the credit crunch. The bank has posted negligible profitability in 2007 and had been forced to make write downs of several billions of euros in its US mortgage portfolio. Oudéa quickly saw that investors were rapidly becoming averse to risk, and he unveiled a strategy of partnering with fellow financial institutions, through which, he said, risk would be shared. The first partnership came at the beginning of 2009, when Société Générale formed an agreement to merge parts of their asset-management businesses, in a €700bn joint venture. Under the terms of the deal, Credit Agricole has a 70 percent interest in the joint-venture, with Société Générale holding the remaining 30 percent. Oudéa highlighted that one of the most significant effects of the joint venture was the dramatic reduction in the group’s cost-base. Further to this, Société Générale sold a significant stake in its underperforming Russian banking arm, OAO Rosbank, to Cyprus-based Interros International Investments Ltd. The purpose of the deal was to reduce consumer-banking losses in its Russian subsidiary. Oudéa’s has ploughed ahead with his risk-mitigation strategy in 2010, announcing, in June, a five-year plan to restore investor confidence in the company. The plan involves further restructurings of the bank’s Russian assets, the augmentation of new customers in its home market, and expansive cost cuttings. The result of this plan, he said would be net profits for 2012 of €6bn – an ambitious statement, given that net profit for 2009 was just €678m. However, the plan appears to be working. Société Générale’s posted net profits of just over €3bn for the first nine months of 2010 – a figure that analysts had forecast for the full year. But today it seems that investors require far more than financial results. Shares in the bank fell by a total of 31 percent in 2010, perhaps in part due to the approximate €3bn risk it bears in the form of Greek government debt. And herein lies the core of Oudéa task. For too long Société Générale shareholders have endured the taking of risks that have seen the bank battered from pillar to post, whether by market conditions or from individual negligence. What Oudéa must do is introduce a culture of security, which in turn increases stability and help win over the doubters.